I have many restaurants on my St. John’s bucket list, one of which is The Club. I have been hearing good things about it for a couple years now and I finally had an opportunity to check the place out during lunch. Upon arrival we were greeted by a friendly server who offered us to select our seats (we were one of the first in the resto as we were there prompt for the opening at noon). The décor is rustic and well placed; it seemed laid back by yet sophisticated and inviting. We picked the booth in the back for the lighting and the view inside and out. It was early in the day so we ordered pop for the drink as we looked over the menu; I was impressed that pineapple crush was a pop selection! The menu was filled with many offerings that I wanted to try but alas, I did have to make a decision on one (or two). 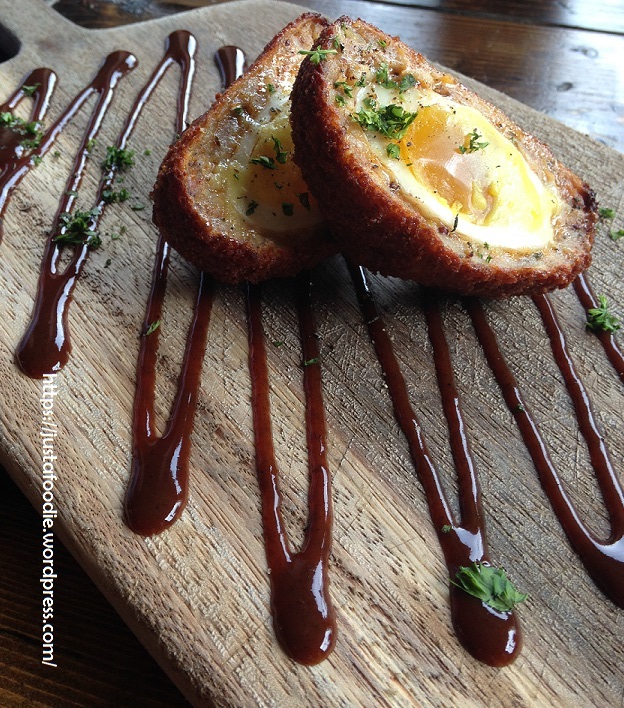 My choice was made when I saw the Scotch egg in the starters section; I did not expect to see this on the menu so of course I had to have it. I was not disappointed with my selection, the presentation was clever, after all it is just an egg right? Not at all, actually it is a sort of marriage so to speak, between a perfectly cooked egg that was wrapped with meat, in this case sausage then a light crust and deep fried. The flavor was well balanced and delicious; I was tempted to order another. For my main I ordered the fish and chips with the dressing and gravy (of course!). The fish was light and flaky and the spritz of the malt vinegar complimented both the fish and home cut fries. 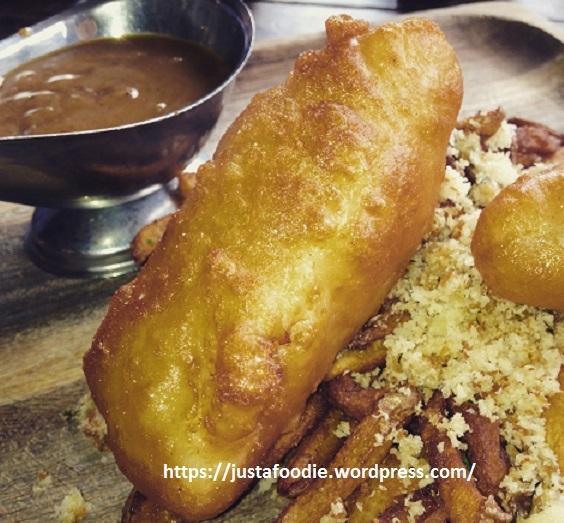 The batter was light and offered another layer of texture to the dish, I am a picky fish and chip kind of guy but I would rate this up there in the top five I have tasted. The service was timed well for lunch time and the server gave us just the right amount of attention. I would be remiss if I did not mention that the washroom were nice and clean, fresh cloth hand towels too!! The Club is certainly my type of restaurant, great décor, a nice variety of amazing food and although I have not indulged in one there (yet), it seems like a great place to unwind with a pint! This being my first visit , I have no low points or issues to comment on. I shall return!